Like bricks they encumber you. And without them you have less. There are only a few moving parts, if you classify the pages as one thing. You have a cover and the pages and the words. Perhaps moving words, too. If you open the cover and look at the content on the pages you will often see mostly words and sometimes words and images. This is how you work with the parts. Take the time to read the words and you begin to understand how books work. There you find another mind. You find someone willing to share with you a point of view, a story, a vision. 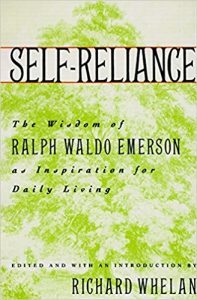 With Emerson, you may find immutable wisdom that is profound in its simplicity and simple in its profundity. Should you decide not to open the cover, you have instead, a brick.